I must be a glutton for punishment. Wednesday I transplanted 23 tomato seedlings into our garden. After I looked at the 3-day forecast, I installed drip-irrigation buckets in the Tomato Patch and mulched most of the plants yesterday (Thursday) morning. My drip irrigation system wasn’t expensive. In fact, it was free. I use recycled plastic buckets. I’ve drilled four half-inch holes in the bottom of each bucket. 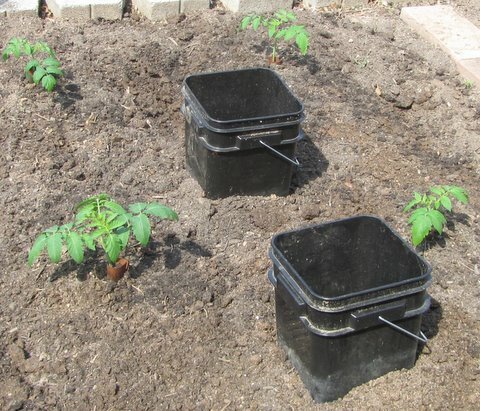 I set the buckets three to four inches deep in my Tomato Patch, strategically placed in the rows between plants so each bucket will serve two, three, or four plants and so I can easily hose water into the buckets. My tomato mulching system is also is simple. I use a small garden rake, newspaper, water, a trowel, and straw. Mulch benefits my Tomato Patch in several ways. It keeps my patch weed free most of the summer. No weeds mean less work for me in the hot, summer sun. Mulching also conserves moisture, which means I will seldom have to water. More water in the soil helps the calcium intake of my tomato plants, which helps prevent blossom-end rot. Also, over time mulch decomposes, enriching the soil. 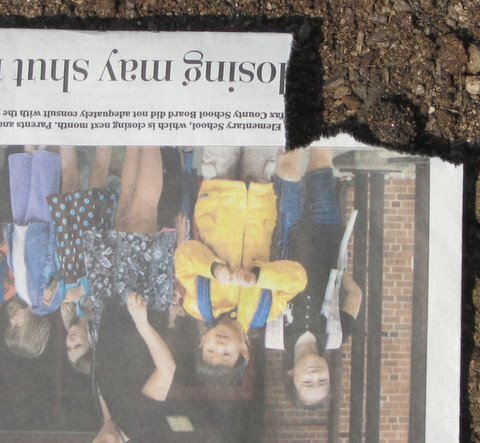 After I install the drip-irrigation buckets, I use my small rake to level the soil around the buckets and the plants, so the newspaper I’ll use as the base of the mulch will make good contact with the soil. 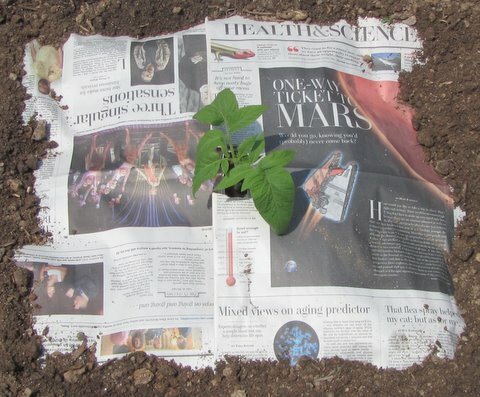 Then I place newspaper two sheets thick around each plant. I use full pages on each side of the plant, with a hole torn in the middle of one edge of each page. The sheets overlap down the middle, with the torn hole surrounding the tomato stem. I used to use three or four sheets but observed they often didn’t decompose over winter, so now I use only double sheets. The photos will give you an idea of how I use the paper. After I position the two sheets of double-thick paper around a plant, I use my hand or a trowel to pull soil over the edges of the paper to help keep it in place. That worked well yesterday for about an hour until a breeze started to rearrange some of sheets that I had positioned around plants. That’s where water helps. I turned on a nearby hose and began spraying the sheets as soon as I put them down. Wet newspaper doesn’t blow easily. A watering can would work just as well. When the breeze came up, I decided to put the straw on top of the paper as soon as I had paper positioned around a plant because sunshine dries even wet newspaper in a few minutes. 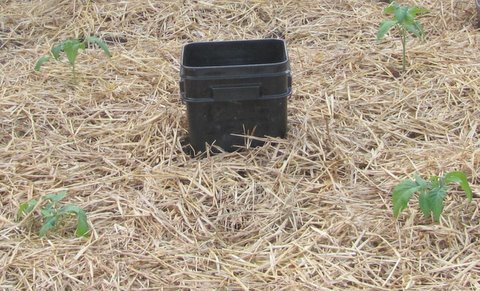 I use straw because it is clean, relatively inexpensive, and decomposes well. A bale lasts me two or three years. You can use almost any kind of mulch, including grass clippings, but don’t use grass clippings if you’ve recently applied a broad-leaf herbicide to your lawn. Tomato plants are sensitive to such herbicides. I shake straw in and around the plants and position it by hand. How much do I use? If I can read headlines through the straw, I add a little more straw. If I can see a glimpse of paper here and there but can’t read headlines, or see no newspaper, that’s OK.
After I add the straw, I hose it gently to settle it. I’ll wet it another time or two over the next few days, but it usually settles well and seldom blows away, even in summer thunderstorms. Do I have to somehow pick up all that paper in the fall or next spring? Not if the sheets are just double. Once they are moist and in contact with the soil, natural decomposing of the paper—which is made of wood fiber– begins. Summer showers and rains encourage the process. If I notice large pieces of paper in the fall, I chop them with a shovel. I seldom find paper the next spring. I installed eight drip-irrigation buckets and mulched 19 of my 23 tomatoes in about three hours. By then I was dead tired and glad I had to stop mulching because I had run out of newspaper. Why not save some fun for tomorrow–right? Well, I enjoy doing it, despite minor aches and pains. The tomatoes will be delicious. Friends love the extras. And gardening keeps me tuned in to the cycle of life, lets me participate from seed sowing to harvest, an experience most people don’t have today. My badge of honor: dirt under my fingernails. But then an ache—or was it a pain?—reminded me that my bones and joints are ageing. Perhaps I should cut back on the number of tomato plants next year. Yes, I should cut back, just a bit, mind you, next year. I’ll try to remember that … next year. Some really great tips here, thank you! I am planning on using newspaper too. I thought to put a lot of paper down, but hadn't considered how much of it would NOT decompose. Thank you for this information. You accomplished a lot! It is too cold here, I think, to mulch 😦 but the darn grass is coming back up in my tilled garden. I like your drip irrigation system. I will have to see if I can get some more large buckets and try this!! LOVED this post. I was trying to think of a better way to water my tomato bed that has–dare I say it–over forty tomato plants. Standing there and watering a 5,000 square foot garden Friday was more than a challenge. I have the garden divided into several beds. Perhaps I can find smaller containers to cut holes into and bury into the rows within the beds. If you check my post about “Big Fat Earth” you can see my garden. Can you tell me your thoughts on whether smaller containers would work?